On 25 September 1967, to the thrill of all aboard, Cunard's mighty sisterships RMS Queen Mary and Queen Elizabeth sped past each other in mid-Atlantic for the very last time. It was widely believed that two giant passenger liners of this kind would never again be seen together on the North Atlantic as, high above, jet planes now reigned supreme. Inevitably, one illustrious passenger liner after another succumbed until only one true transatlantic liner remained, against all the odds, as a tangible reminder of the halcyon days. But Cunard's Queen Elizabeth 2 was more than just a survivor. QE2 became the symbol for the ultimate sea travel experience and the standard by which all other cruise liners were compared, a position she held right up until her retirement in November 2008. Building on this outstanding success, Cunard announced in 1998 a brand new transatlantic Queen to join their fleet. At over 150,000 tons, she was to be the largest and most expensive passenger liner ever built. In January 2004, Queen Mary 2 entered service, and in the April, joined QE2 in a highly historic combined transatlantic crossing. This was QM2's maiden eastbound voyage out of New York, and QE2's last regular crossing of the ocean she majestically plied for 35 years. Thus, two giant Cunard Queens did indeed simultaneously grace the North Atlantic once again. After producing the official QM2 artist's impression for Cunard in 2000, Gordon Bauwens submitted sketches for a series of commissioned paintings to hang in public areas aboard QM2. One of these looked ahead to the two Queens leaving New York on 25 April 2004, at the start of their historic tandem transatlantic crossing. This drawing became the basis for Cunard Queens, one of his two large oil paintings now hanging in the Grand Lobby of QM2. 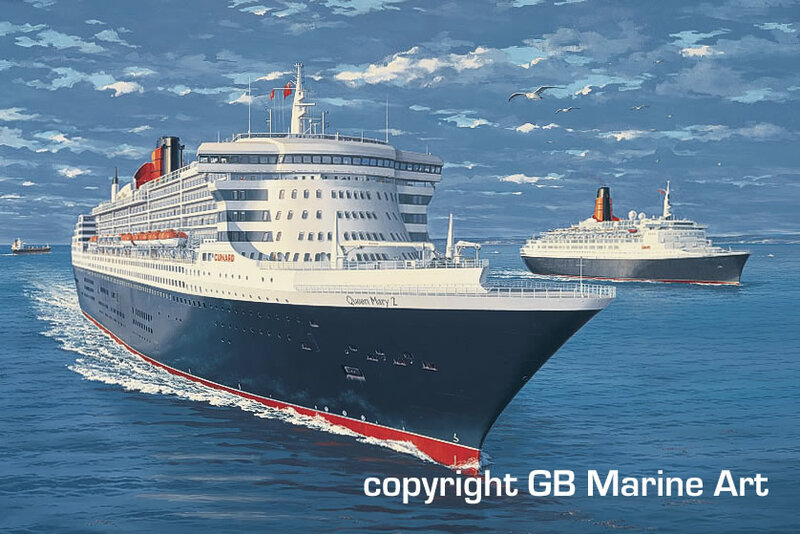 Further inspired, in January 2004, Gordon Bauwens took up brush again to portray the two majestic Cunarders as they were scheduled to appear on the last day of the same epic voyage. The resultant Majesty at Sea fine art prints are available as highly collectable mementos of this thrilling piece of maritime history. Produced on heavy acid-free art paper in fade-resistant inks, each print is artist-signed and numbered and comes with its own matching Certificate of Authenticity. Limited edition of 1150 individually signed and numbered fine art prints. "I may have dreamt up the ultimate ocean liner but only you could have captured her on canvas as you have! Majesty at Sea is a wonderful painting. I wish you every success with it."